GPRO is a certificate program that teaches the people who build, renovate, and maintain buildings the tools to integrate high-performance construction and maintenance practices into their everyday work. Our holistic approach to sustainability training—combined with expert advice and the latest adult learning techniques—have made GPRO an education trailblazer for building trades and operators across the country. GPRO students stay ahead of the curve with training on high-performance building construction and earn the GPRO Certificate upon passing the trade-specific exam. 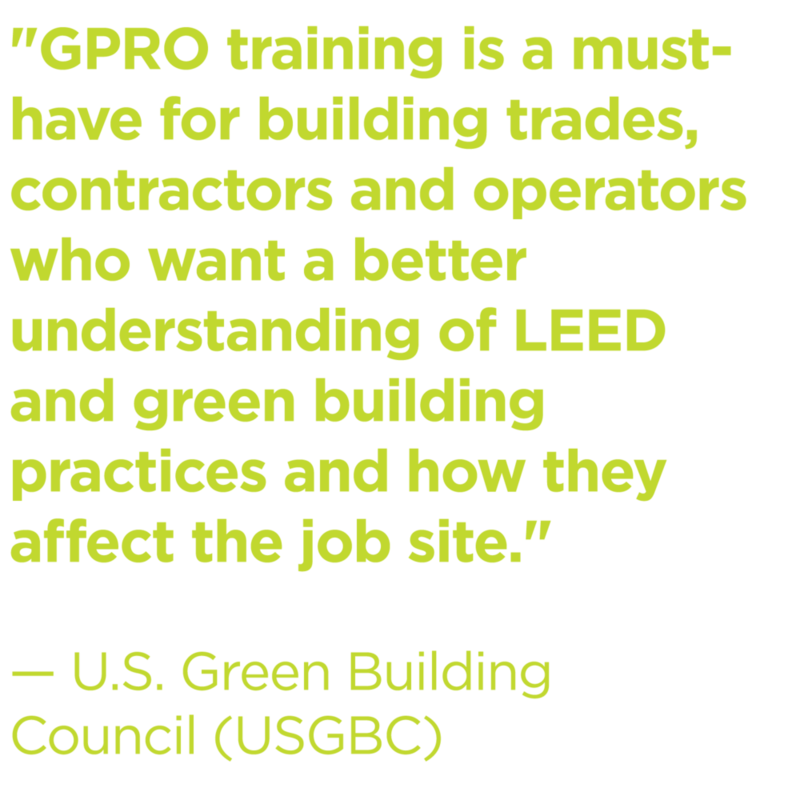 Since 2017, the U.S. Green Building Council Los Angeles has delivered GPRO training to the Los Angeles Metropolitan Transit Authority (Metro) through the Growing a Greener Workforce program. Bringing together members of the larger community with a diverse range of Metro departments, the goal is to raise consciousness about sustainability issues and inspire action. The result is a perceptible shift in thinking, reinforced by new forms of collaboration and information-sharing wit­­­hin Metro and the LA community. Since 2014, GPRO’s partnership with the Canada Green Building Council (CaGBC) has allowed us to train nearly 400 professionals in three Canadian provinces. This success would not have been possible without dedicated instructors and advocates like GPRO Master Trainer Eric Chisholm, who have been vital in educating the Canadian workforce in GPRO’s sustainable building concepts.